This is the second part of the BIH haul. This wheel consists mostly from cool undertone polishes. As you can see, I got a lot less of those, so the wheel remained unfinished. You could admire some of them already on Maestra’s photos. 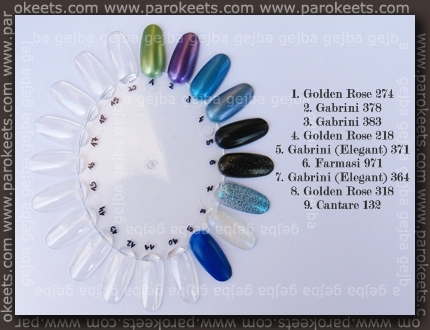 Like Gabrini 383 and Gabrini 364 in a duet with Golden Rose 318. Gabrini Elegant 371 is really dark dark blue. I have something special in store for this polish. I already showed you Cantare 132. This one was bought at the latter date and then added to the wheel. HERE is the first oval … in case you missed it. Next articleMedusa’s eye primer – Stick it! Jaz jih arhiviram, tako da lahko na hitro primerjam odtenke med seboj. Čudoviti so lakci pod zaporedno številko 2.,3. in 4., medtem ko mi je 9. Cantare 132 tudi lepa, a preveč vsakdanja. Gejba, ali takšen oval, ko ga enkrat “nalakiraš”, potem arhiviraš?